The art of practicing daily gratitude has been shown to greatly increase happiness and positive emotions. 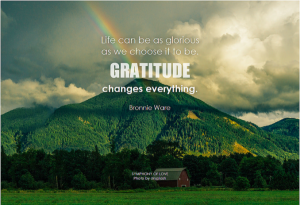 An article from happify.com states, “people who regularly practice gratitude by taking time to notice and reflect upon the things they’re thankful for experience more positive emotions, feel more alive, sleep better, express more compassion and kindness, and even have stronger immune systems.” What exactly is gratitude though and how can you really manifest gratitude in your life? Some good synonyms to take into account when wrapping your head around gratitude or beginning a daily gratitude practice are acknowledgement, appreciativeness and thankfulness. Emmons goes on to explain that there are two main stages of gratitude: 1. The acknowledgement of goodness in one’s life and 2. Recognizing that some of the sources of this goodness lie outside the self. With the second stage, your gratitude practice can start expanding out into the world with thankfulness reflecting outwards from yourself and your own life, letting in gratitude for nature, animals and the world we live in. 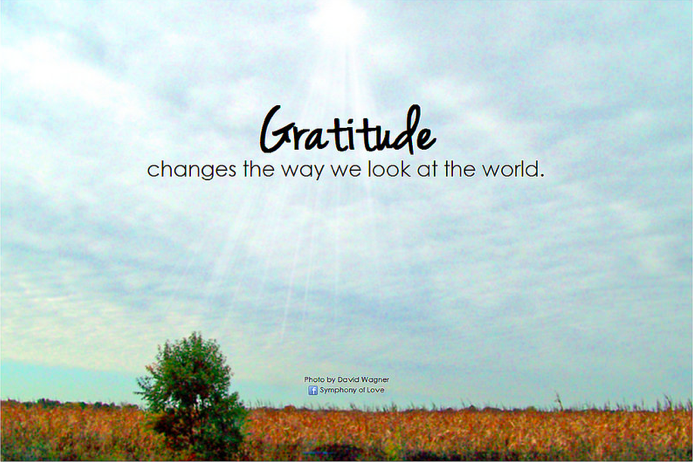 There are many ways to bring gratitude into your life. A helpful way to increase your daily practice and therefore train your brain to more easily drop into a place of thankfulness is to start your own gratitude journal. When thinking of, or writing down things you are thankful for, get as detailed as you can. This allows the little things to go noticed and be appreciated just as much as the bigger broader categories. It is good to verbally express those things you appreciate as a way to build positive relationships with friends, partners, co-workers, family members, maybe even a stranger at the grocery store that has just helped you find the coconut oil or shared their coupon with you. Try taking some of these ideas that appeal to you and incorporate them into your daily or weekly routine. Clearly, there are some amazing benefits to training the mind to drop into a place of gratitude throughout your life. Studies (fMRI-functional magnetic resonance imaging, brain-scanning and other more subjective testing) show the more you practice gratitude the more your brain will adapt to this way of thinking and feeling. It is similar to exercise and weight training in that regard, you are strengthening and building a “gratitude muscle” within your brain. This can help offset negative feedback loops one has created in their brain and improve their overall quality of life.